After the very conservative S-Type, a car that tried to echo the British firm’s glorious past, the Jaguar XF was a breath of fresh air. 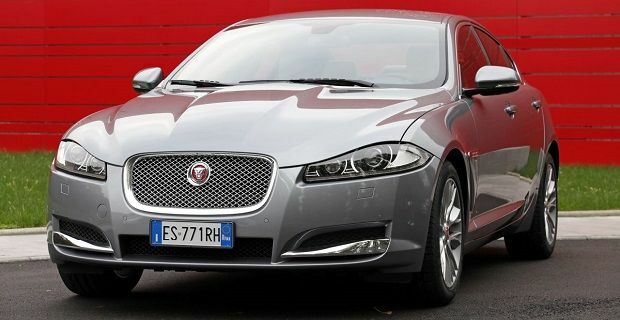 Jaguar’s executive car has been around since 2008 so it’s about time that it was refreshed to compete with the latest offerings from Mercedes and BMW, and this new look 2014 Jaguar XF should help boost sales. The looks have been slightly smoothed over but the overall affect is a sleeker and more modern car. There are few cutlines along the body, and with a new look in the cabin this is a now a genuine rival for the Mercedes E-Class and BMW 5-Series rather than an alternative for exec car owners wanting a change. The Jaguar XF is now in its seventh model year and over that time Jaguar has strove to keep the car relevant to the marketplace. Last year saw the introduction of a new range of engines including four-cylinder and a supercharged V6 motor that supplemented the V8 already sold with the car. The turbocharged four-cylinder is probably the pick of the revised line-up. It produces 240bhp which is quick enough for most exec drivers, but if that’s not enough power there’s 380bhp on tap in the V6 thanks to the supercharger. If money’s no object and you like your Jaguar to look a little sedate then the supercharged V8 with 470bhp or the XFR with 510bhp are available. If you’re happy for your exec saloon to look like a Holden Monaro then the Jaguar XFR-S with 550bhp and a 186mph top speed is the only one to go for. While Ford was in charge of Jaguar cars, the British brand produced retro looking machines like the X-Type and S-Type. Under Tata’s ownership they’ve become a bit braver and much more modern. We hope that trend continues.